The Cinema Parenthèse program concentrates on Mazière's films from the 1980s that eschew paradigmatic concerns in experimental film practice like the representation of space in film and the translation to film of the perceptual experience of the look. Functioning in a painterly vein that coalesces musical rhythm to the jouissance of experiencing privileged moments within a range of spaces, they lead to phenomenological enquiry on the relationship between perception and the act of viewing. In this period, Mazière was also a member of London Filmmakers Coop (LFMC) and edited the Avant-garde film magazine, 'Undercut'. A momentary flight into blood coloured spaces; "Blood Sky" reveals a “...swirlingly red world transformed by camera movement.” Independent Media. A highly experimental film which uses a kaleidoscopic array of techniques to question the representation of space in film. The film can be read as an existential journey through interior spaces or as a phenomenological inquiry into the relationship between what is seen and the act of seeing. 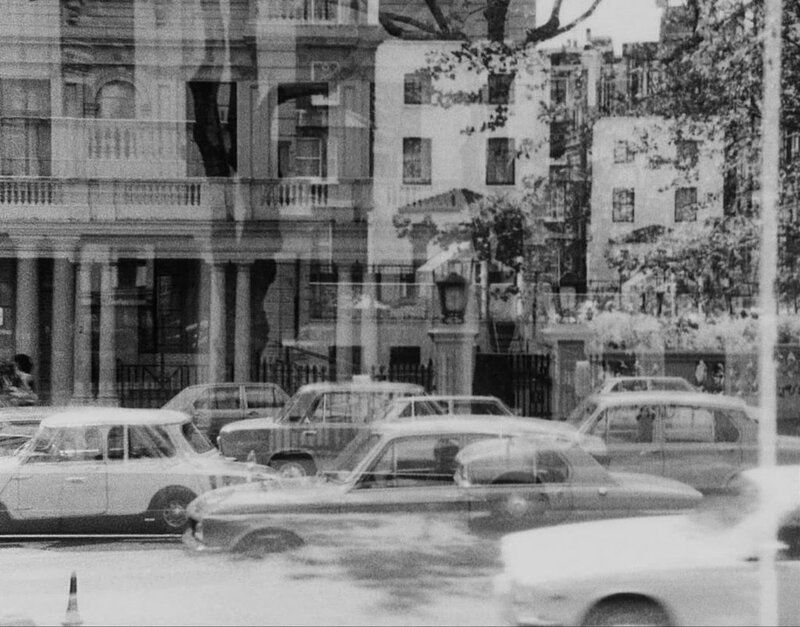 By using a multiplicity of camera movements, image superimpositions, sound dislocations, the film presents spaces in constant transition and consecutively in motion, never assuming a fixed form. Shot through the process of travel and edited in camera the film presents those transitions in a direct and moving way. Focusing mostly on exteriors and landscape the film documents a series of instances and privileged moments within a range of spaces. "Swimmer" is the second film of a series titled ‘The Bathers Series’ initially inspired by the paintings of the same name by Paul Cezanne. The film is a celebration of the body in motion within a synthesis of water, light, colour and sound - through the use of intense editing, printing and saturated images a tension is created touching on pleasure, pain and desire. A poetic and ironic tribute to the city of Budapest using footage filmed on the Mayday worker Festival and archival photographs from the turn of the century. A celebration of the city akin to the city 'symphonies' of the 20's and 30's with the iconography of the old Eastern Europe, its architecture, trams and its people set in a series of fleeting glimpses and rhythmical paces. "Cezanne's Eye" is an experiential journey through the body of a unique landscape - that of Cezanne's Provence. Using intuitive and expressionist visual language and a striking specially composed soundtrack the film is a movement through land, sky colour, sound and music that is both sensual and visually challenging.